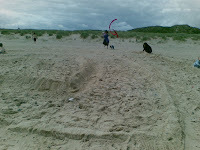 Today was labyrinth making day on Old Bawn Beach, near the studio and south of Cahore Point in Wexford. I have long been a fan of mazes and Labyrinth. In my teenage years I doodled mazes, decorated and painted them. When I studied art therapy I discovered mandala's and read about the symbolism and healing process in making them. I came to understanding that labyrinths also had these qualities but never remember reading about them. In the last year I discovered Status Hat and their Labyrinth project (CURRICULUM AND INSTALLATION/EXHIBITION DEVELOPMENT). In the last few weeks I have loved reading Jim Buchanan's book 'Labyrinths for the spirit'. His book inspired today. Why make a labyrinth? Partly to see how easy it would be to make one, curiosity, testing the idea, partly personal interest. The idea was to have a day away from work and the typical mayhem around raising three boys. 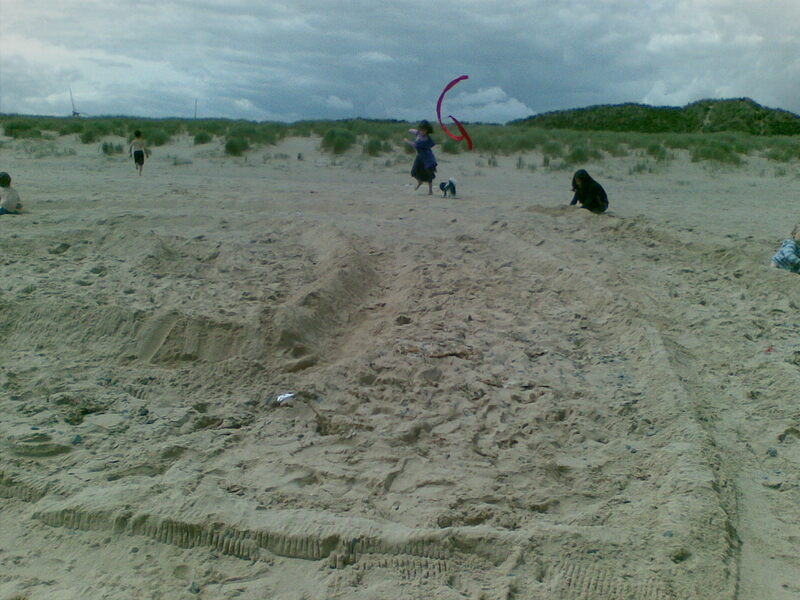 What I took to the beach: 3 boys, a picnic, a rake, a trowel, two bamboo sticks, red material for a ribbon, fishing rod, football, suncream, towels and swim gear. It was made clear to them that we were going to the beach in the morning and spending the full day there. I mentioned the plan to a few who I thought would apreciate the idea of making a labyrinth and put the word out on facebook and twitter also. 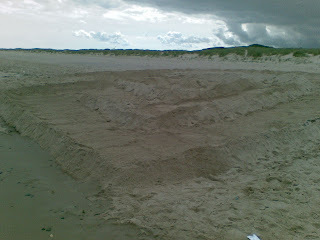 I originally had a plan to make the labyrinth up the beach but the sand was too dry and a lot of raking would have been required. Two friends and their families were on hand to join in. 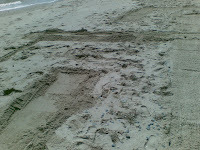 So I started by showing how to draw a small labyrinths down by the waters edge. Then some discussion about where and how big and I started. A big cross raked in the sand with the dots in four corners of the square, then the methodical drawing and linking of the straight with the dots to form the simplest of labyrinth shapes. I had some questions about the pathways and the wall. 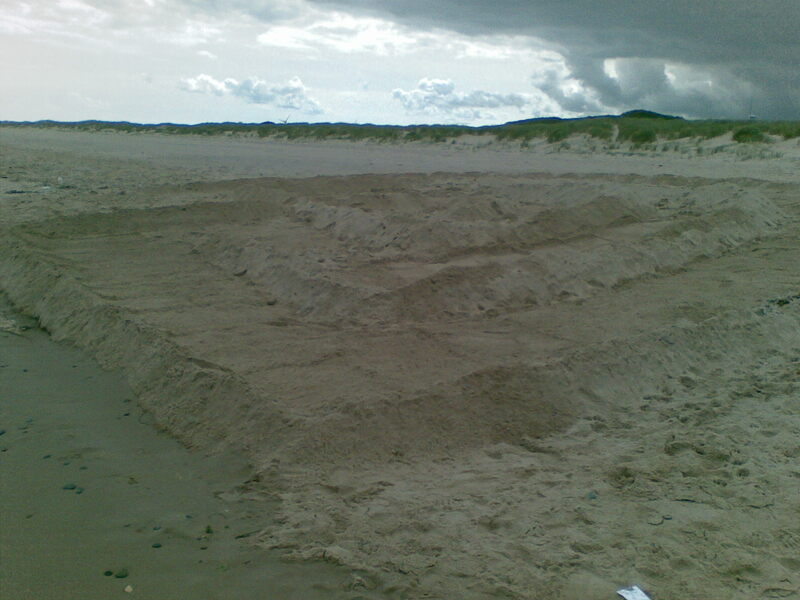 We settled on the idea that the walls could be rills where the incoming tide could flood and some notion that our collective children would dig them. After a short time it became clear that single walls were best. Walking the labyrinth the mouth was at the waters edge, it was lovely to walk down towards the sea and the center was just that central and a bit cosy. There was plenty of chatting and catching up. People walking by on the beach were curious and asked us about what we were doing. It was lovely to share the idea and see their response. Even a local seal kept an eye on us for a while. 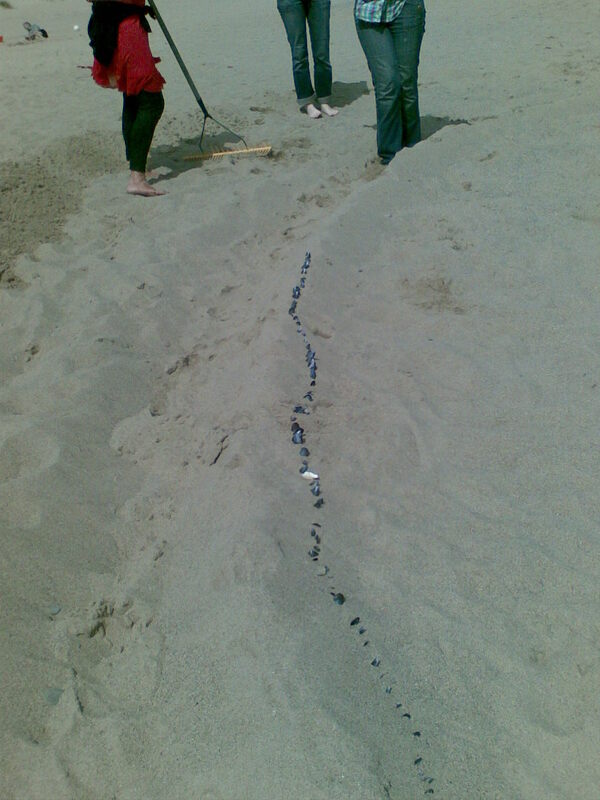 In the next photo you can see the line of mussel shells three year old Harry started. It formed a lovely decorative edge. 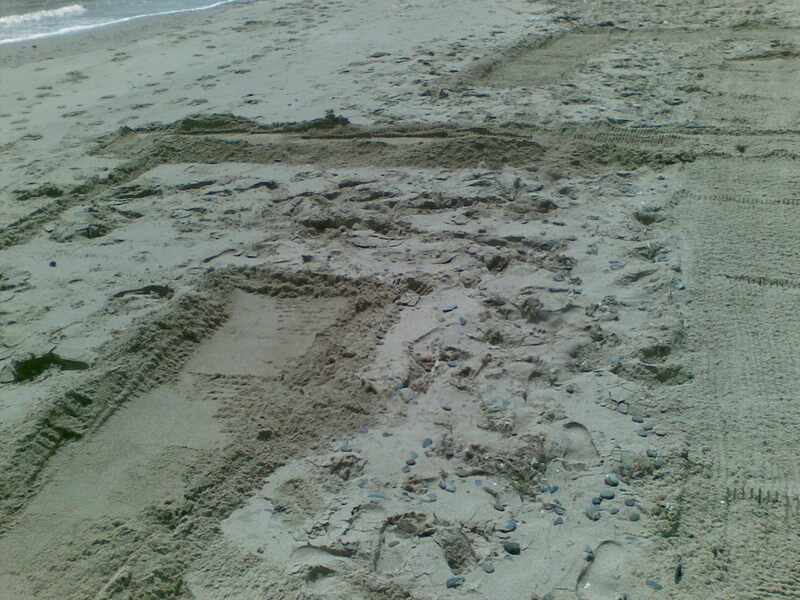 I had brought a large garden leaf rake which was lovely to use and left a good pattern on the sand. 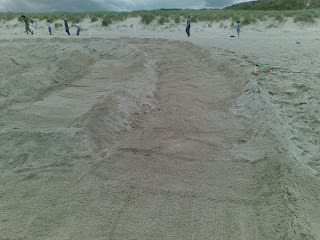 We all took turns in using it and building the walls. The wind was not so strong and yet the walls diminished. I found raking the path to the walls wonderfully relaxing and mindfully bliss. I can see how a zen garden would be relaxing. Friends and associates difted on to the beach and drifted away again. It was lovely to have such a relaxed day that ebbed and flowed. The children ran around the labyrinth and over the walls. The adults did walk it but it was hard to have the quiet solitude to walk the labyrinth in a mediative practice on the beach. Partly because our kids were around, running around having great fun playing together! Hey that's really important too. 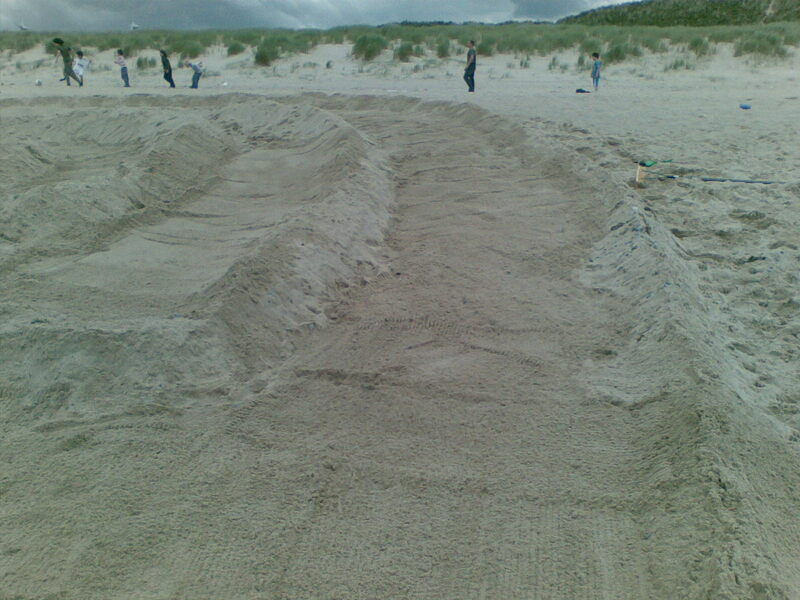 I look forward to making the next one for the moment I am in a happy glow of having spent all day in the fresh air beside the sea building a giant adult sandcastle and sharing the experience with others. I'd love to find away to use this in my arts practice perhaps with a group of people, as a team experience or a soulful creative way to share a collective experience. Along this journey I have discovered the Labyrinth Society a great website where I found out there is a World Labyrinth Day and that people train to become facilitators of labyrinth walking and making. There has been some very interesting research done on labyrinths, the most frequently researched topics are the effects of interacting with a labyrinth on stress and on relaxation. Who knew? Local places to visit with mazes include Dunbrody Abbey Wexford, Greenan Maze and Museum Wicklow this also has a Solstice Labyrinth, Russborough House West Wicklow has a very nice beech maze small but perfect. This sounds like a perfect day and a perfect activity. I got interested in labyrinths after visiting Grace Cathedral in San Francisco a few years ago (modelled on the one in Chartres cathedral). Lauren Artress' book on the project is beautiful.